Cosonok's IT Blog: How long to do 100 Vserver Creates / 100 CIFS Server Creates / 100 CIFS Server Renames? How long to do 100 Vserver Creates / 100 CIFS Server Creates / 100 CIFS Server Renames? 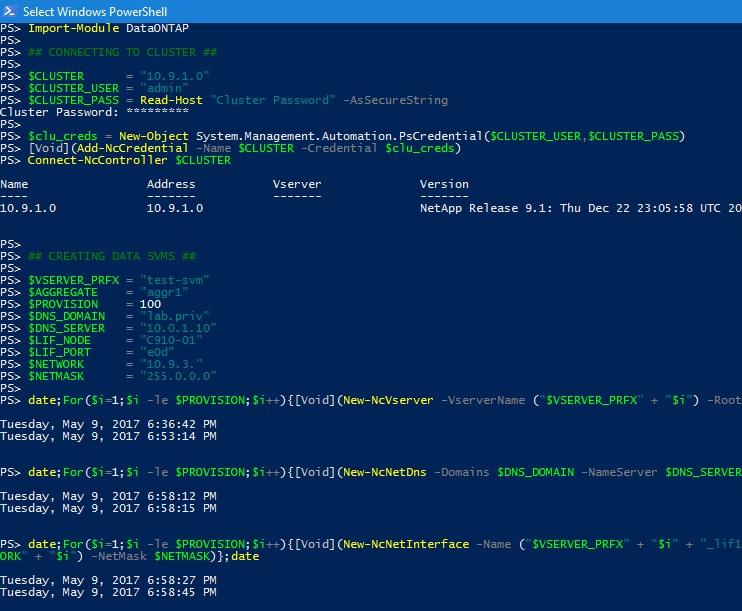 Note: This is done with the DataONTAP PowerShell Toolkit Version 4.3, and the NetApp ONTAP 9.1 simulator. I wanted to know how long the titular tasks would take, so here’s how I did it and the timings. We start with the timings and then present the method. 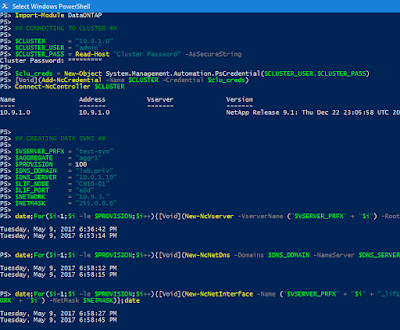 The following PowerShell commands were used to automate the 100 vserver creates, 100 CIFS server creates ...; but this is not a PowerShell script - these are all one liners entered directly into PowerShell (see below outputs). No reason why you couldn’t turn this into a script though.